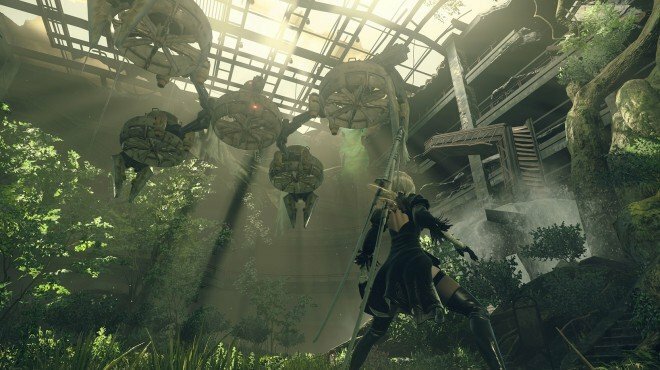 Tower Recon is a Main Story Quest in NieR: Automata. "2B is gone, and 9S awakes at the Resistance Camp 2 weeks after the events at the commercial facility. It would be wise to learn what has happened in the vecinity of City Ruins"
Select 9S after completing Loss or Destroy Machines. At the resistance camp, after a chat with Devola and Popola, you can pick up some side quests: Gathering Keepsakes and (after you have left and returned once) Devola's Request. You also unlock Devola's and Popola's Item Shop. Head outside, and you will witness The Tower, a new location that emerged from underground after the Loss quest. Head over to its center and attempt to hack the structure. This will trigger Obtain Keys.